RICHMOND, VA – Sports Backers, in partnership with Ragnar Relay, is announcing the new ‘Run Bike Relay presented by Ragnar’ to be held on June 22-23, 2018. The overnight relay event will go from Richmond to Jamestown and back, utilizing trails in the James River Park System, the Virginia Capital Trail, the T. Tyler Potterfield Memorial Bridge, and the Greensprings Greenway Trail in James City County, among others, as participants aim to complete this exciting new relay event on foot and by bike. Registration is now open for the event at www.sportsbackers.org, and the course map can be found at the following link: http://www.mapmyrun.com/routes/fullscreen/1969794191/. During the relay, teams of four, two, or even solo racers will bike and run a 120-mile route from Virginia’s capital city to Jamestown and then trek back to Richmond. There are a total of 12 segments made up of six running and six biking legs. The running segments range in length from four to six miles and consist mostly of dirt trails, while the biking segments range from 13 to 20 miles and will occur on paved trails. Each participant will complete at least three sections of the course, with the specific order determined by each team. Ragnar offers the largest overnight relay series in the United States, and the Run Bike Relay marks the second time that Sports Backers and Ragnar are partnering for an event, after the Ragnar Trail RVA event, now in its third year at Pocahontas State Park. 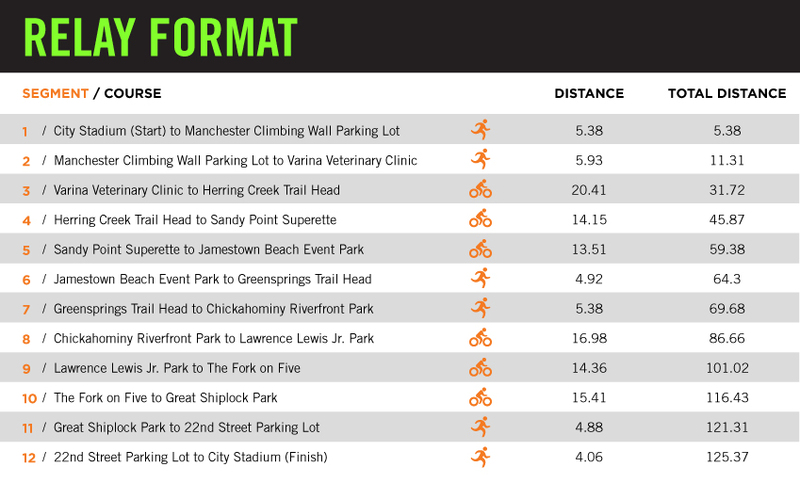 Sports Backers and Ragnar share a goal of visiting inspiring and scenic destinations, and the James River Park trail system and Virginia Capital Trail, among other course highlights, will provide a challenging backdrop for Run Bike Relay participants. The Virginia Capital Trail Foundation is the official event charity of the Run Bike Relay presented by Ragnar. Their mission is to enhance, promote, and advocate for the continued development of the Virginia Capital Trail, a 52-mile dedicated multi-use trail connecting Richmond and Williamsburg along the historic and scenic Route 5 corridor. Registration for regular (four-person), ultra (two person), and solo (one person) teams is now available at www.sportsbackers.org, with a June 15 entry deadline.